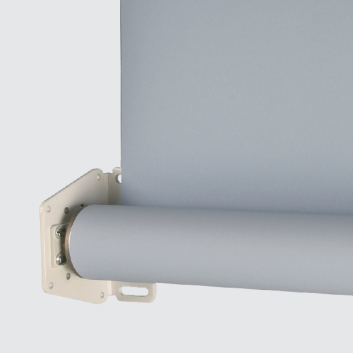 This YewdaleDefiant® R56 overhead roller blind system is supplied with crank operation. White aluminium brackets allow for top or face fixing with 50mm and 57mm grooved aluminium barrels. The fabric is mounted onto a sprung 57mm aluminium barrel whilst at the other end it is fitted to a white Tear Drop aluminium bottom bar, attached to two draw tapes. These tapes are attached between flanged guides to the 50mm drive barrel, operated by 1:4 gear control mechanism and crank handle. Both the R56 and the R57 roller blinds are the ultimate in choice for the shading requirements for sloping or horizontal roof windows. 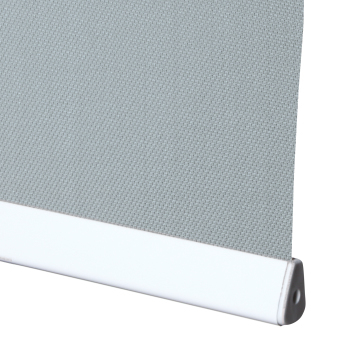 With heavy duty componentry and a powerful spring action, these blinds may be confidently specified for awkward or inaccessible locations. The detachable magnetic crank handle provided with this model removes the common issues associated with locating the drive at height and solves the problem of unauthorised use. Tear Drop aluminium bottom bar in black or silver; Fixed crank handle. YewdaleDefiant® R56 crank operation overhead roller blind with 1:4 geared crank mechanism as manufactured by Yewdale, +44 (0)1268 570900. Flame retardant fabric from the YewdaleDefiant® range, on 57mm aluminium barrel with enclosed spring attached to white Tear Drop aluminium bottom bar as standard. 53mm drive barrel connected to gear control crank mechanism operates blind by means of draw-tapes to the bottom bar. Supported by study, attractive brackets and incorporating magnetic detachable crank handle.